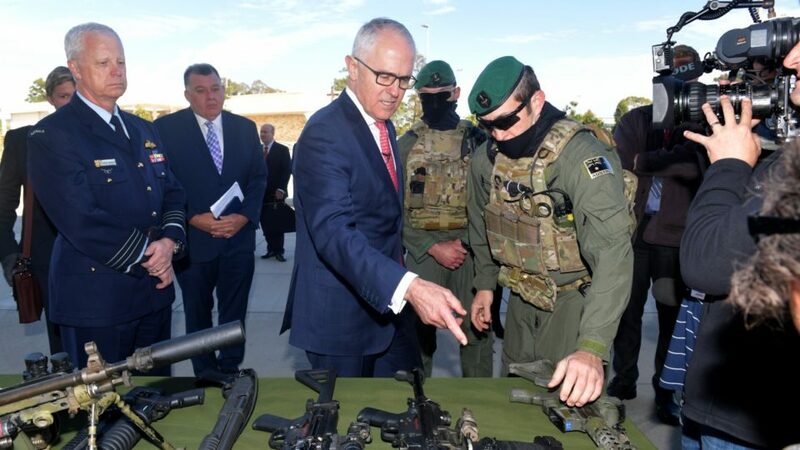 The announcement that Australia is attempting to be a major arms exporter (“Major defence boost”, canberratimes.com.au, January 29) makes a mockery of any pretence we might have to being a peace-loving nation. A country doesn’t try to destroy the market for the products it’s flogging. PM Turnbull’s claim that it’s all about “jobs” is a contemptible fig-leaf for forcing people into the business of war profiteering. If he wanted more jobs he’d show us research on which sectors of society provide the most jobs for a given expenditure. Such research just doesn’t exist in Australia, but evidence from elsewhere indicates that health, education and public transport rate far better than building weapons. Australia has passed up the opportunity to be a world leader in renewable energy, but now chooses to spend $3.8billion on a weapons financing facility. Meanwhile we have slashed our overseas aid mercilessly. Our contribution to the world in coming years will not be in helping reduce the climate disruption that is already happening, or assisting those most vulnerable, but in profiteering from the tensions and wars that follow. Australia has also spent more on commemorating World War I than any other nation, presumably to keep the warrior spirit alive and well, but our leaders have refused to take a jot of notice of what that war teaches us, especially about the dangers of arms races. Our PM’s excitement at the prospect of Australia being a leader in death and destruction is degrading and pitiful. First published as a letter, Canberra Times 30 January 2018.